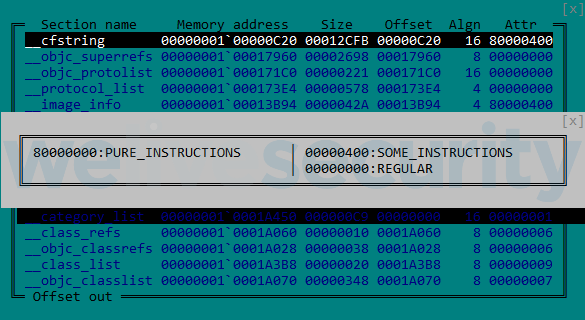 Latest ESET research describes the inner workings of a recently found addition to OceanLotus’s toolset for targeting Mac users. Early in March 2019, a new macOS malware sample from the OceanLotus group was uploaded to VirusTotal, a popular online multi-scanner service. This backdoor executable bears the same features as the previous macOS variant we looked at, but its structure has changed and its detection was made harder. Unfortunately, we couldn’t find the dropper associated with this sample so we do not know the initial compromise vector. We recently published a detailed update about OceanLotus and how its operators employ a wide range of techniques to gain code execution, achieve persistence, and leave as little trace as possible on a Windows system. OceanLotus is also known to have a malicious macOS component. This article details what has changed from the previous macOS version analyzed by Trend Micro and describes how, while analyzing this variant’s code, you can automate string decryption using the IDA Hex-Rays API. The following three sections of this blogpost describe the analysis of the sample with the SHA-1 hash E615632C9998E4D3E5ACD8851864ED09B02C77D2. The file is named flashlightd and is detected by ESET products as OSX/OceanLotus.D. As usual for OceanLotus macOS binaries, the sample is packed with UPX, but most packer identification tools do not recognize it as such, probably because they mostly include a signature that relies on the presence of a “UPX” string, and further, Mach-O signatures are less common and not as regularly updated. This particular characteristic makes static detection more difficult. Once unpacked, one interesting thing is that the entry point is located at the beginning of the __cfstring section in the .TEXT segment. This section has the flag attributes seen in Figure 1. As seen in Figure 2, the fact that the code is in the __cfstring section tricks some disassembly tools to display the code as strings. 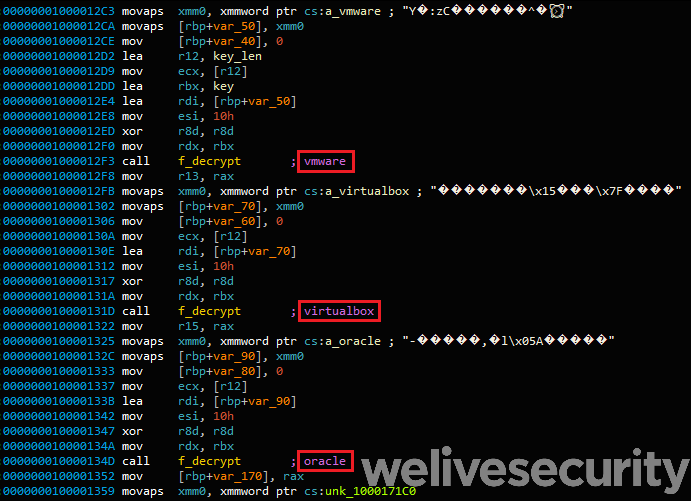 Even though the backdoor commands have not changed since the Trend Micro article, we noticed a few other modifications. The C&C servers used for this sample are quite recent as their creation date is 2018-10-22. The URL resource used has changed to /dp/B074WC4NHW/ref=gbps_img_m-9_62c3_750e6b35. The first packet that is sent to the C&C server contains more information regarding the host machine. All data gathered by the commands in the following table are included. On top of this configuration change, this sample does not use the libcurl library for network exfiltration. Instead, it uses an external library. To locate it, the backdoor tries to decrypt each file in the current directory using AES-256-CBC with the key gFjMXBgyXWULmVVVzyxy padded with zeroes. Each file is “decrypted” and saved as /tmp/store and an attempt to load it as a library made using the dlopen function. When a decryption attempt results in a successful call to dlopen, the backdoor then retrieves the exported functions Boriry and ChadylonV, which seem to be responsible for the network communication with the server. As we do not have the dropper or other files from the original sample’s location, we could not analyse this library. Moreover, since the component is encrypted, a YARA rule based on these strings would not match the file found on disk. Before being hashed, the character “0” or “1” is appended to the return value indicating root privileges. This clientID is stored in /Library/Storage/File System/HFS/25cf5d02-e50b-4288-870a-528d56c3cf6e/pivtoken.appex if the code runs as root, or in ~/Library/SmartCardsServices/Technology/PlugIns/drivers/snippets.ecgML otherwise. This file is normally hidden via the _chflags function and its timestamp is modified using the “touch –t” command with a random value. Like previous variants, the strings are encrypted using AES-256-CBC (hex-encoded key: 9D7274AD7BCEF0DED29BDBB428C251DF8B350B92 padded with zeroes and the IV is filled with zeroes) using the CCCrypt function. The key has changed from previous versions but since the group is still using the same algorithm to encrypt strings, decryption could be automated. Along with this article, we are releasing an IDA script leveraging the Hex-Rays API to decrypt the strings present in the binary. This script may help future analysis of OceanLotus and the analysis of existing samples that we have not yet been able to obtain. At the core of this script lies a generic method to obtain the arguments passed to a function. Moreover, it looks for the parameter assignments in order to find their values. This method could be reused to retrieve the list of arguments of a function and then pass them to a callback. Knowing the prototype of the decrypt function, the script first finds all cross-references to this function, finds all the arguments, decrypts the data and puts the plaintext inside a comment at the address of the cross-reference. In order for the script to work correctly, the custom alphabet used by the base64 decode function must be set in the script and the global variable containing the length of the key must be defined (as a DWORD in this case; see Figure 4). In the Function window, you can right-click the decryption function and click “Extract and decrypt arguments”. The script should put the decrypted strings in comments, much as in Figure 5. This conveniently lists the decrypted strings together in IDA’s xrefs to window for that function, as seen in Figure 6. The final script can be found on our Github repository. As recently documented in another of our articles, the OceanLotus group keeps improving and updating its toolset, and once again, it has improved its tools for targeting Mac users. The code has not changed that much, but because many Mac users don’t run security software on their machines, the need to evade detection is of less importance. ESET products already detected this file when we found it. Since the network library used for the C&C communication is now encrypted on the disk, the exact network protocol used remains unknown. The IoCs in this blogpost, as well as the MITRE ATT&CK attributes, are also available in our GitHub repository. Defense Evasion T1158 Hidden Files and Directories The backdoor hides the clientID file via chflags function. T1107 File Deletion The backdoor can receive a “delete” command. T1222 File Permissions Modification The backdoor changes the permission of the file it wants to execute to 755. T1027 Obfuscated Files or Information The library used for network exfiltration is encrypted with AES-256 in CBC mode. T1099(macOS) Timestomp The timestamp of the file storing the clientID is modified with a random value. Discovery T1082 System Information Discovery The backdoor performs a fingerprint of the machine on its first connection to the C&C server. Exfiltration T1022 Data Encrypted The backdoor encrypts the data before exfiltration. Command and Control T1094 Custom Command and Control Protocol The backdoor implements a specific format for the packet involving random values. See Trend Micro article.